We have been supporting Kenia-Kinder-Hilfe e.V. (KKH) at Oberursel/Taunus, a charitable association in Germany that is helping children and adolescents in Kenya (www.kenia-kinder-hilfe.de). KKH has founded and still operates an orphanage in Langobaya and supports child care facilities, schools and youth centres in the Malindi. 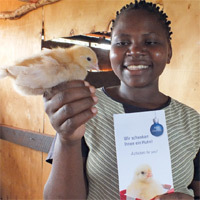 Our Christmas campaign “A chicken for you” made it possible to erect a henhouse on the orphanage’s premises, among other activities. We also support projects for the education and vocational training of children and youths from the orphanage and surrounding communities.